Spanish cinema lost one of its most talented and at the same time humble actors very recently. Álex Angulo, who passed away in a car accident at 61 years of age, received hundreds of condolences from fellow actors and artists right after the tragic news reached the net. He was really loved and respected in the profession, and also by the public. At this point, some non-Spanish readers might be wondering who this actor was and which films did he star in. He appeared in various Spanish TV series – Periodistas, for example – and several films. His international breakthrough came with Guillermo del Toro’s fantasy film Pan’s Labyrinth, in which he played the merciful and Republican supporter Dr Ferreiro. In Spain though, Angulo was remembered – and will always be – as Father Berriatúa, Álex de la Iglesia’s El Día de la Bestia’s popular anti-hero. El Día de la Bestia starts in a wide chapel which contains a gigantic Christian cross, where a priest prays silently. Father Ángel Berriatúa (Álex Angulo), obviously nervous and agitated, approaches the former and requests confession. When asked about his sins, he declares not to have sinned yet, although his intention is ‘to carry out as many evil actions as he possibly can’. His confessor seems to understand and agrees to stand by Berriatúa, whatever the cost. Literally five seconds after pronouncing these words, the priest is crushed by the disproportionate stone cross. Enter the film’s title credits. We do not know whether to laugh or to feel scared yet. Berriatúa travels to Madrid, and he eventually reveals he has found out the Antichrist is going to be born right there, in the Spanish capital city, on December 25th. In his quest to find out more information about the Satanic event’s exact time and place, he meets ‘affable’ drug user José Mari (Santiago Segura) who owns a heavy metal record shop down-town. Unsure about where to begin with, they decide to contact Professor Cavan (Armando de Razza), an expert on the occult whom they have seen on an obviously fake tv show. Together, the three of them attempt to make contact with the Evil One (‘El Maligno’) in order to prevent the end of the world from happening. El Día de la Bestia cannot be easily classified in the one specific genre: comedy, drama, tragedy and horror blend masterfully into a movie which burst the Spanish box office at its release. I actually know someone who watched it six times back then. This is significant, because Spanish audiences did not feel appealed by Spanish cinema around the mid 90s. The great directors of this generation, such as Alejandro Amenábar (Tesis, Abre los Ojos), Juanma Bajo Ulloa (Airbag) and De la Iglesia himself were but starting. What makes it such a popular film? Very high doses of black humour, quite common in the Spanish culture, seems to me to have played some part in it. The film is set during the Christmas period, when the streets are filled with joy, carols and cheerful shoppers. 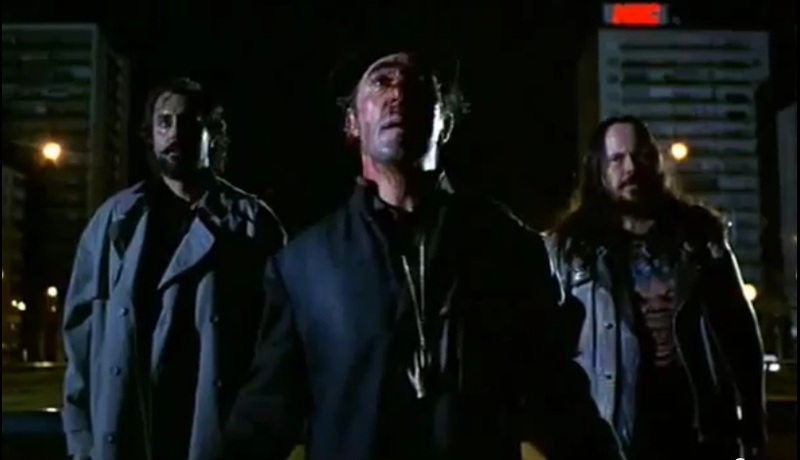 During one of the main scenes, a very high José Mari opens fire in the middle of an over-crowded shopping area, and even the three Wise Men (Santa’s equivalent in Spain) are forced to run away in terror. It is actually a comic scene, even though it does not sound like it. Secondly, its unforgivably iconic characters. As the director himself has pointed out, Father Berriatúa and his Satanic friend José Mari are somehow based on Cervantes’ anti-hero Don Quijote and his good natured sidekick Sancho Panza. There are a few parallelisms between both characters: the madness, the general sense of tragedy, the belonging to a different reality altogether. Both Berriatúa and Don Quijote are capable of inspiring pity and laughter in equal measures, depending on the situation or even the eye of the beholder. But De la Iglesia’s influences do not only relate to high literary figures, as part of his background comes from comic books. Indeed, El Día de la Bestia could have been thought of as a graphic novel: it is dark and violent outwith the conventions of the horror genre. Some stills in the film are very visual, and certainly resemble drawings taken out of graphic novels. This only adds up to the film’s cult status, turning it more atemporal in the spectators’ memories. The urban background – it was filmed in Madrid – is key to the plot too, as some of the city’s monuments play a main role in the story. The Kio Towers – which funnily enough host an important banking firm now – are eventually identified as the Anti-Christ’s birthplace. We are also shown Ricardo Bellver’s Monument of the Fallen Angel, thought to be the world’s only public display of Satan’s image. For me, however, it is the neon Schweppes sign in Plaza del Callao which really reminds me of the film so much that I cannot separate one from the other anymore. If you ever walk past it as you stroll along Madrid’s busy Gran Vía, look up and check whether there is someone hanging off there. The day of the Beast might be coming soon. As an American viewer and English speaker, I think I might have missed few of the more symbolic things in this film. I purchased a Korean version of the film because there was a review by a film critic/university professor who made the claim that this had sociological implications about the Spanish Civil War. (Obviously, the Last Circus is a Civil War film.) I understand a lot of Spanish cinema refers back to the war and I was trying to wrap my head around this film in that regard. And while I love some of the truly great films out there that are tied into the Spanish Civil War – I specifically like the horror genre. Any ideas are appreciated. Hi Clint! Thanks for your comment. As you mention, many films have been recently analysed from a historiography perspective. Personally, I had never considered El Día de la Bestia as a metaphor of the Civil War, as opposed to the obvious symbolism of The Last Circus. Initially, this film was produced as a cult film, since Álex de la Iglesia’s sources of inspiration encompass all sort of cult and pulp material. This critic/scholar that you mention could have a really good point! On the other hand, De la Iglesia is considered an auteur in Spain – always pushing himself to deliver original, funny yet thrilling stories. He is one of the great directors of his generation.